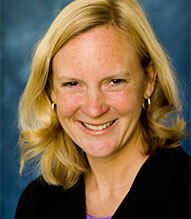 Dr. Smythe offers readers a careful selection of sacred texts because she has a bone to pick; that is, the dialogue between selected biblical passages and her core belief in the triune God guides her to where theological goods are mined that most likely will help her readers engage in their process of discernment. But they are also selected with a full awareness that a primary reason why people disagree over this topic concerns how to read the very passages she has selected to study. While the reasons for these disagreements are complex, often involving social worlds as much as linguistic analysis, the practices for doing so are properly communal. This is a book that encourages interested people to read, study, and discuss Scripture together. Worshiping God and studying Scripture together cultivates those characteristics that enable earnest Christians to resist the tendency of allowing disagreements between them to harden into non-negotiable positions that occasion harsh and hurtful accusations of others on the other side of the divide. This provides a context for both understanding and reconciliation. A theological interpretation of Scripture does not bring a particular modern “criticism” to the biblical text but, rather, a range of theological interests as ancient as the church. Strong students not only recognize that Scripture bears authoritative witness to God’s saving work in history, they expect that a faithful reading of Scripture targets the loving relationship between God and God’s people. That is, if Scripture is approached as a revelatory text, then any Spirit-directed application by its faithful readers should result in a more mature understanding of God’s word whose effective yield is a more satisfying life with God. The practical problem of such a task, of course, is the abundant surplus, not scarcity, of theological resources at the church’s disposal in its Scriptures. In fact, one could say that the Bible, from beginning to end, is about the relationship between God and God’s people: what does it truly mean to be God’s people and do as they ought? In part, this is because the Bible is the church’s holy Scripture, shaped and sized from beginning to end in the company of the holy Spirit to size and shape a holy church that is also one, catholic, and apostolic. Toward this end, every Scripture is God-breathed to inform, form, and reform God’s people into a covenant-keeping community, a light to the nations. This book is deeply grounded in the church’s confession that its Scripture—every bit of it—is God’s inspired and inspiring word. Any attentive engagement with what Scripture says, especially if it demands our repentance, as I think this book does, not only recognizes the holiness of the biblical texts that are studied—even those well-known “texts of terror” such as 1 Timothy 2:9–15—but their proper reading and application within the economy of grace. That is, Scripture is the sanctified auxiliary of the holy Spirit who teaches us God’s word and draws us into loving communion with God and with all our neighbors. 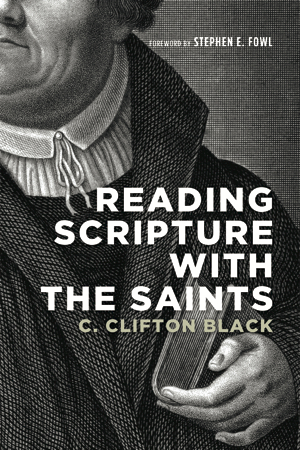 The practice of studying biblical passages together commends the belief that Scripture’s authority cannot subsist apart from an engaged community of readers who carefully and prayerfully wait upon the Spirit to disclose God’s truth to them. I’ve had the fortune this summer of working on two projects that stand apart for me among the many book projects to which I attend. I am sure all of the authors with whom I work would like for me to tout their latest writing project. And if I had the time, I would. Despite the sometimes mundane tasks of cleaning up commas and repairing sentence structure, I really do get to have my hands in the making of a lot of wonderful books. A person could get lost for hours browsing the titles we publish. 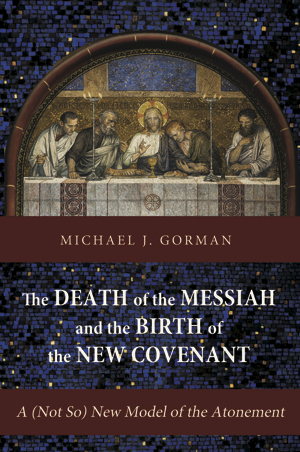 Out now is Michael Gorman’s terrific new book on the atonement: The Death of the Messiah and the Birth of the New Covenant: A (Not So) New Model of the Atonement. As with all of Gorman’s books, I can’t recommend this one enough. With this biblically and theologically mature study, Michael Gorman shifts our focus away from fascination with the how of the atonement and toward reflection on the what: What does Jesus’s death accomplish? The result is a richly textured statement of how the atonement reaches deeply into the scriptural story of God’s mighty acts in order to present the consequences of the cross for the church’s faith, hope, and love. In chapter 2 Black shows himself to be a tour guide with positions and commitments of his own. His Ten Theses for biblical interpretation with a trinitarian understanding harmonize well with the rising voices in the choir of theological interpretation. He says much about each thesis. I simply list them here and encourage you to get the book when it is available (hopefully) next month. Considered reflection on the triune God is appropriate to exegesis that attends to the Bible’s theological character. If, as the historic church has confessed, the Trinity is a true and faithful expression of the God whom it worships, then that doctrine inevitably bears on the church’s understanding of the Bible as Holy Scripture, its inspiration and sanctification, prior to its disciplined exegesis. Even as theology arises from worship, the native habitat for a Trinitarian approach to Scripture is the church and its ancillary communities, like schools of theology, whose special vocation in service to the gospel is the strengthening of the church’s ministry. No academic exegete is required to practice scriptural interpretation as herein characterized, nor is every student required to study the Bible as Christian Scripture. For Christian theological exegetes, Trinitarian doctrine tends toward a less sectarian, more comprehensive, and arguably less problematic framework within which to read Scripture. The components of a Trinitarian confession—the integrity of Persons that voluntarily respect the space between themselves and one another, thereby fructifying loving freedom—suggest a salutary framework within which to consider the variety of biblical texts, the diversity of interpretive methods, and the inevitable divergence among Scripture’s interpreters. A Trinitarian hermeneutic does not abjure historical criticism en bloc. It embraces and opens up historical investigation while challenging historicism’s fatalistic imperialism. A Trinitarian approach to exegesis is eschatologically pregnant, affirming God’s freedom to dynamite interpretive obstacles and to guide Scripture’s faithful readers to fresh, truthful insights. So understood, scriptural theology recognizes no insuperable division between scholarly and devotional reading, even though the needs of different communities respect differences of emphasis. There will always be a place for the occasional book or conference or course focusing on leadership itself—on the qualities and techniques of an effective leader. But the more such books and conferences and courses proliferate, the more they need to be matched by a different sort of leadership-discourse: the sort that deliberately places the theme of leadership off-center and out-of-focus, orienting it toward the ends which it ought to serve and locating it within the relationships in which it ought to belong. 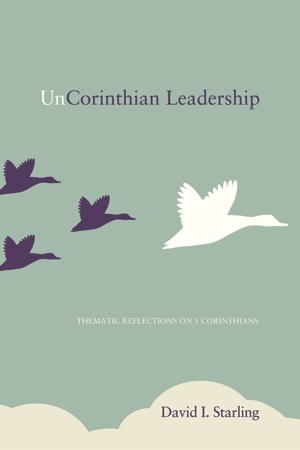 I’m finishing up a proofread of Starling’s excellent little book, UnCorinthian Leadership: Thematic Reflections on 1 Corinthians. It should be sent to the printers next week. I recommend pastors, evangelical and otherwise, pick it up and read it straight away. leadership is the act or task of making an intentional contribution toward the direction and motivation of a group in the framing and pursuit of a common purpose. The concept of leadership, understood according to this definition, is thus closely related to but distinguishable from the concepts of authority, office, teaching, and servanthood. Thus, while 1 Corinthians is not a Pauline leadership manual, it is (one could argue) something even more useful for our current purposes than that. It is an inspired, canonical case study—a worked example of what is involved in the complicated task of disentangling the various components of leadership from the cultural matrix in which they have come to be understood, in order to reorient them toward their proper end. For three days in November of 1964 fourteen of America’s best known Christian peacemakers gathered, by invitation of their host Thomas Merton, at the Abbey of Our Lady of Gethsemani in Kentucky for an informal retreat to discuss “The Spiritual Roots of Protest.” Gordon Oyer, with an insatiable “curiosity and relentless digging,” has reconstructed for our generation the story and discussions from those three days at a monastery in the damp, chilly, rural Kentucky hills. Jim Forest, one of the fourteen participants, recalls the persistent question during those three days—”By what right do we protest?” He writes, “Merton and others at the retreat made me more aware that acts of protest are not ends in themselves but ultimately must be regarded as efforts to bring about a transformation of heart of one’s adversaries and even one’s self. 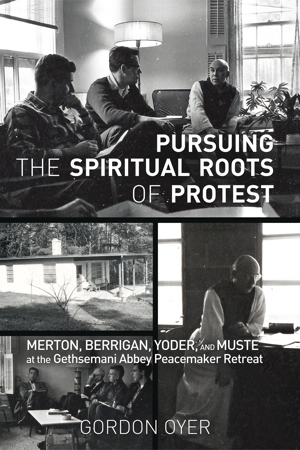 . . Merton put great stress on protest that had contemplative roots, protest motivated not only by outrage but by compassion for those who, driven by fear or a warped patriotism, experience themselves as objects of protest” (from the Foreword). It seems these days, especially in America, people are quite willing to “protest.” But as people queue up to buy chicken sandwiches, boycott television networks, and hold signs at freeway overpasses, I wonder how compassionate their motives are. As briefly and pointedly as can be stated, my argument is this: adoption of a politics of non-violence was, for Paul and the communities he established, a constitutive part of the gospel of Jesus Christ. Rather than viewing Paul’s references to peace and non-retaliation as generalized ethical principles drawn from his Jewish background (though this no doubt contributes to Paul’s understanding of these concepts), these terms and their corresponding practices are linked to Paul’s experience of being a violent persecutor of Jesus’ followers whose violent life was shattered on the road to Damascus. Enlivened by the risen Jesus from this point on, Paul’s task of announcing the gospel to the nations involved calling and equipping assemblies of people whose common life was ordered by a politics (by which I mean, chiefly, a mode of corporate conduct) characterized by peaceableness. Gabrielson’s thesis is important, I think, for today’s Christians who are often more inclined to beat the war drums than smoke the peace pipes. I encourage you to look for the book this coming fall. If you will be in Baltimore for ETS, SBL, and/or AAR in November, you should find discounted copies of the book at our stall. Come by, check it out, and say hi to the Wipf and Stock crew.